Becoming holy is about transitioning from practicing Christian ethics to living in Godly character. It is a teaching tool that gives instruction and guidance on how to achieve the standard that Jesus teaches us in the gospels of the New Testament. Jesus taught and showed us how to live a life pleasing to God, but the key attribute in fulfilling the teaching of Jesus is being holy (consecrated). Becoming holy is not an external alteration but it's an internal transformation. 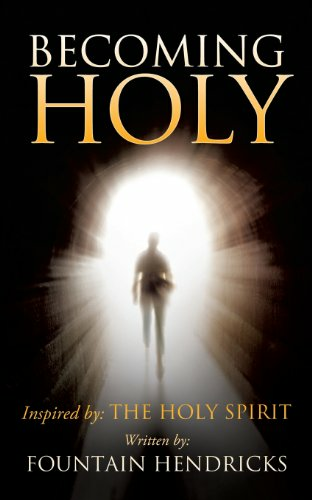 The purpose of this book is to teach people how to achieve the position of holiness and how to live in Godly character. The term live is correlated with being consistent, it's not a one day event, it's a process. This book breaks the boundaries and limitations of modern traditonalism. The process of becoming holy is realizing who you are, then allowing God to break and destroy who you are so you can resurrect to who He wants you to be. This book will be an instrument that will explain what prevents people from being holy, what will cause you to be holy and why it's important to pursue holiness. The pursuit and achievement of holiness qualifies you to be a disciple for the Lord. 1st Peter 1:15-17 says "But as he which hath called you is holy, so be ye holy in all manner of conversation; Because it is written, Be ye holy; for I am holy".